With less than a month to go until the best day of the year, I thought I’d put together a selection of my favourite affordable presents for any beauty lover in your life. Whether it is your mum, your best friend, your Secret Santa, your girflriend or your grandma, there is something here for everyone! Scent is always a great present, as it is something that can be used every day! In an ideal world, you’d know their favourite perfume, but this isn’t always the case. Even if you do know, that is where affordable perfumes come in! 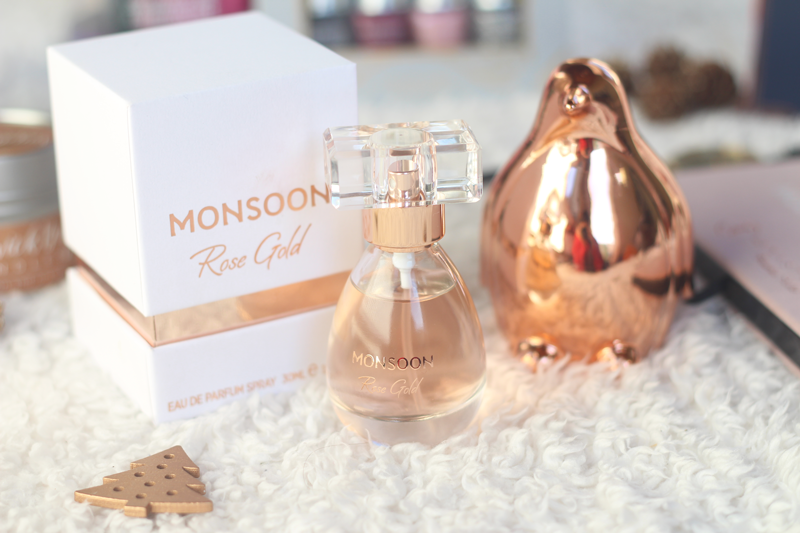 A good mid-range choice is the Rose Gold perfume from Monsoon*. At around £24, it is definitely within a reasonable price, but has the same lasting power and gorgeous scent as a high-end perfume. Rose Gold is a velvety, feminine scent that has a real mixture of undertones that make up a beautiful, every day perfume. With notes of vanilla, amber, lemon and rose, its a good generic choice that isn’t too ‘out there’, so should be a hit with most! It comes in a 30ml bottle, and a 100ml bottle too. At the even-more-affordable end of the spectrum, this Sanctuary Spa body spray! It costs £2.50 regularly, but you can buy it with this bauble-style packaging for around £4. This is such a handy one to pick up as your third gift when shopping 3 for 2 at Boots. If you know the Sanctuary Spa signiature scent, you’ll know just how incredible it is. With base notes of vanilla, patchouli & sandalwood, you can smell citrus and jasmine in there also. It smells like a warm hug from a spa, so relaxing. 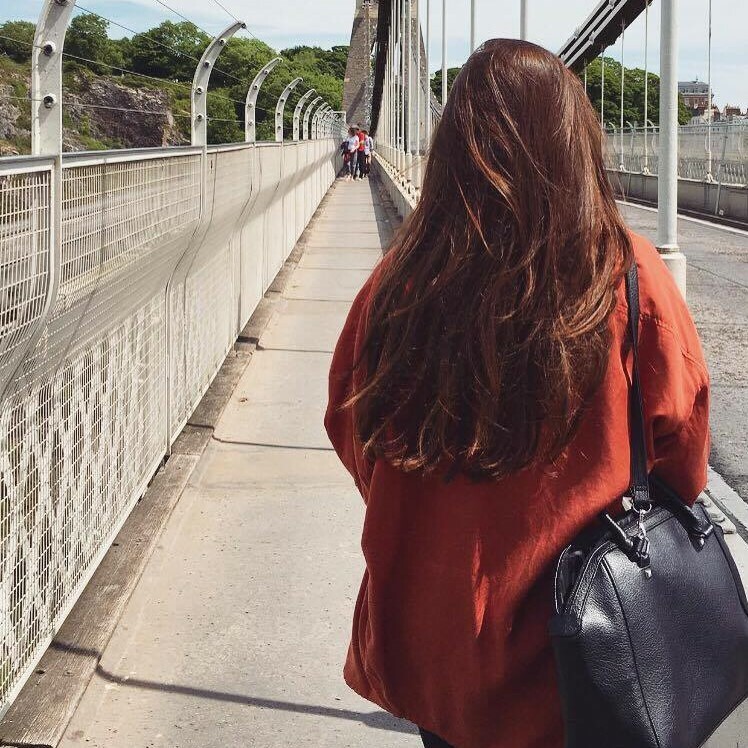 Body spray’s like this one that come in a plastic bottle are ideal gifts, as you can simply throw them into your handbag for the day without having to worry about expensive glass-bottled perfume’s getting damaged. This has to be the most high-end smelling perfume I have tried, without the hefty price tag. My pick has to be the Bestsellers Soiree Collection* because it has everything you need right there. It comes with a base and topcoat, and two polishes and one glitter polish. One is ‘Crushed Grape’ – a perfect winter shade as it is a creamy purple colour, that looks super flattering on both long and short nails. The second is called Butterfly Wings, which is a sheer, monochrome-toned baby pink shade. Finally, a glitter polish! This one is called ‘Twinkle Twinkle’ – a sparkly silver that is perfect for the festive season. 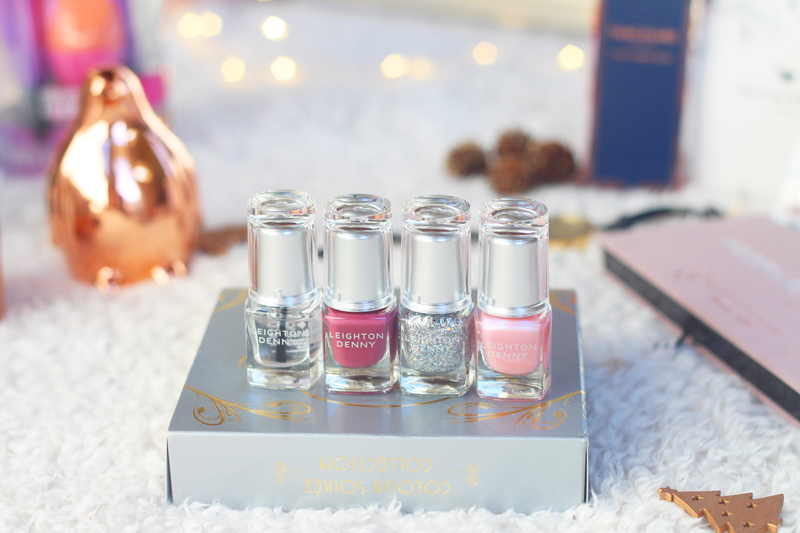 At £16, I think this is a great introduction to nail polish for any younger family members, or a great way to introduce the brand to a nail polish lover. The right tools help makeup application to be smooth and seamless. Real Techiques have been my choice of makeup brushes for about 5 years now. The quality is incredible for the price, and I am yet to try a brush from them that I don’t get on with. For anyone who wears makeup, a new set of makeup brushes will always brighten up Christmas day! 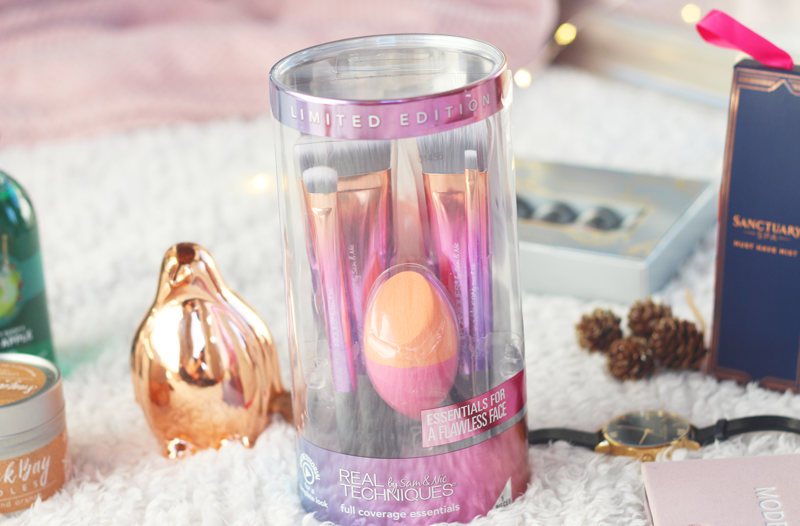 The Full Coverage Essentials Set* is a limited edition gift set (how beautiful are the colours on those brushes!!) that ticks all the boxes. Plus, the fact that it is limited edition makes it extra special. Inside is a large, flat foundation brush for a flawless base and a presicion contour brush for really define your cheek bones. I’m obsessed with this brush – I don’t own anything like this and works brilliantly with cream or powder products, ideal for a night out or New Years Eve! There is a dual ended beauty sponge, for applying blush and foundation. 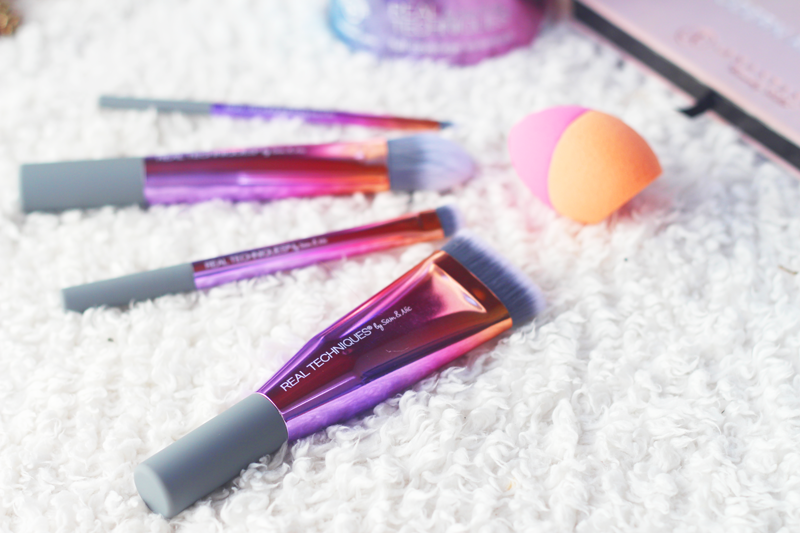 The Real Techinques sponges are always in my makeup kit – affordable but so effective. The set also contains an eye brush, which is dense and provides full coverage. This one is great for buffing out concealer, applying a shadow all over the lid or for applying primer before your eyeshadow. Finally, there is a squared off lip brush – perfect for presicion application of lipstick, and could even double up as an eyeliner. Not one to be missed, I am really impressed by this brush set. 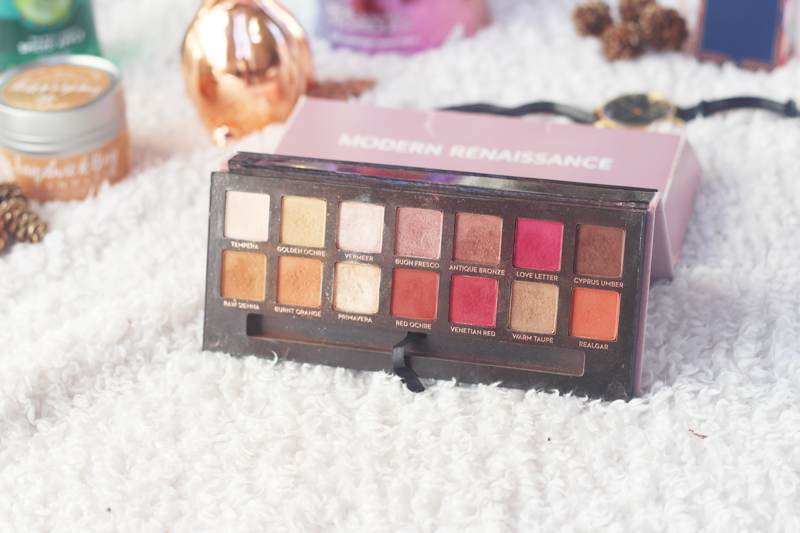 I know £40 is a little more money but as a main present for a beauty lover, the Modern Renaissance palette is such a special gift. My boyfriend bought me one last year and it is without a doubt, my favourite eyeshadow palette ever. This would make a perfect main present – I’m sure any beauty fan would be very happy to unwrap this on Christmas morning. It comes in beautiful, velvet packaging that encases golds, pinks, cranberry tones, along with smokey brown and warm shades that would looks pretty against any eye colour. 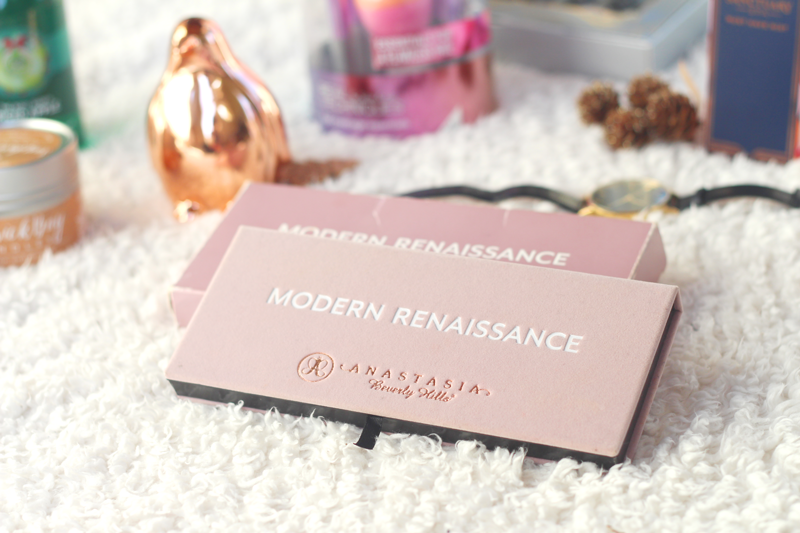 The formula of the eyeshadows is what really makes this palette stand out. They are intesnsely pigmented, super creamy and easy to blend. Now is a great time to have a look for this online, especially as it is currently the Black Friday/Cyber Monday weekend. For girls (or boys for that matter!) who wear false lashes, a set of lashes is a great present or stocking filler. Ideal for friends or Secret Santa too! It is hard to go wrong with a set of Ardell lashes – affordable and reliable lashes. This set* is around £16, and has 4 pairs of flase lashes, so you wouldn’t have to be so precious with each pair. A great little gift to stock someone up with lashes for the next few nights out. If more dramatic lashes are their style, these Kiss lashes are a great choice. The ‘Midnight’ style are faux mink lashes with such a full, fluttery effect. ( I would never buy real mink lashes!! And when faux versions are this good, there no reason to buy the real thing.) At around £5, these are a lovely stocking filler for lash wearers. I hope this Christmas Beauty Gift Guide has been helpful! Have you tried any of these products? These are awesome gift ideas. The nail polish set is a good one.